Paulette and I have had a couple of good days since I last posted, and as we fly out of Munich tomorrow evening this may be my last post, although I might get a final one written if I find time and a wifi connection at the airport. Leaving Salzburg yesterday morning we stopped in Berchtesgaden (back in Germany briefly) for a wander around this attractive alpine town. We then went to Konigsee, a very beautiful alpine lake which has very steep mountains descending into it. The tops of the mountains still have a little snow. We had a good walk to the lake past 500 metres of souvenir and food shops. At the lake there are around twenty boat houses built out into the lake so the tourist boats each have their own garage. Back in Austria we drove over a highish pass through lovely alpine scenery to St Johann in Tirol. It was warm so we travelled with the roof of our convertible down. 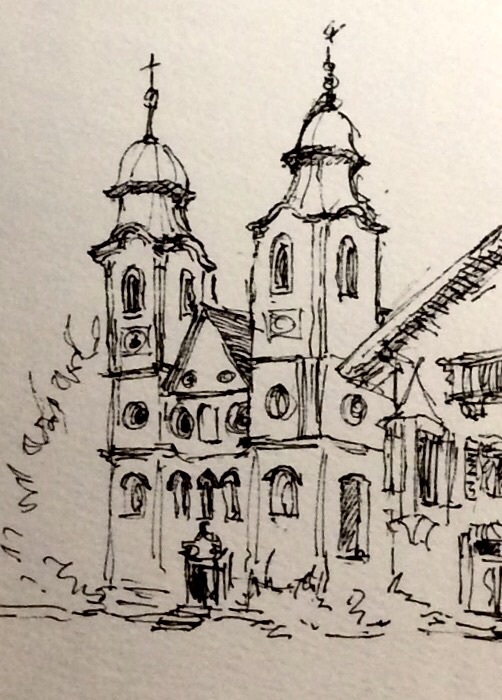 Over the mandatory coffee I sketched the church above. 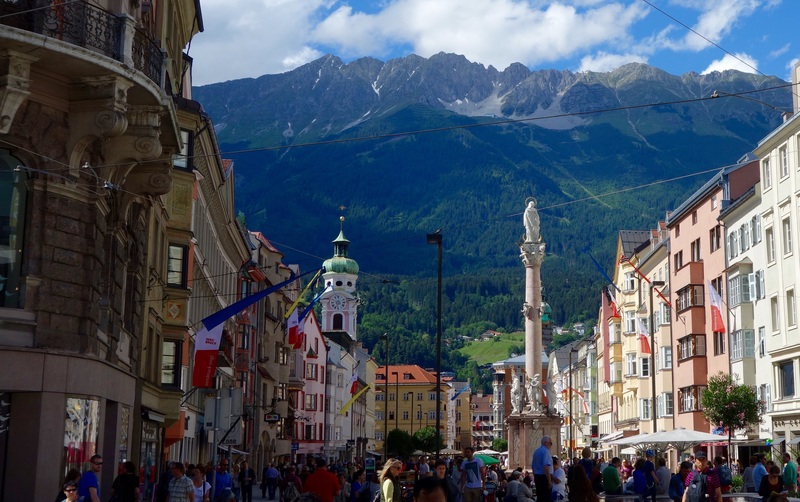 Our route then took us, mostly on the autobahn, to Innsbruck where we found our Gasthaus high above the city near a ski area, although the town is only a ten minutes drive away for dinner. Back in Innsbruck today we spent our time exploring in a very relaxed fashion. Another coffee and a good chat with some Aussies who are having a longer holiday than us. They are traveling by rail with a eurail pass and we discussed the pros and cons of rail v car and decided that the jury was still out. However the 14.7 euro ($22NZ) we paid for parking today might sway the argument. We visited two more churches, the Hofkirche contains the tomb built for Emperor Maximilian in around 1500. It took over 100 years to finish and is guarded by a dozen,or so, giant bronze statues of kings Maximilian considered his ancestors. Albrecht Durer worked on some of the statues and, interestingly one is of King Arthur. Later we took a modern funicular railway part way up the mountain but I did not try to persuade Paulette to go up higher on the cable car.